We have been overjoyed with congratulations, best wishes, thoughtful cards and gifts. My girlfriends have provided lots of reading material. "The magazine is to help plan and the glasses and pain killers are to deal with the planning!" We have a date on hold and are waiting for the contract to be finalized.When and where (easy guess) to follow. Woo! I hope everyone and their families on the East Coast are safe and dry from Hurricane Sandy. I have been without power - those flameless candles I blogged about the other day have come in handy! My office is close by and open, so I've been able to get online. Exciting! Let the planning commence! Love the Kate Spade glasses! 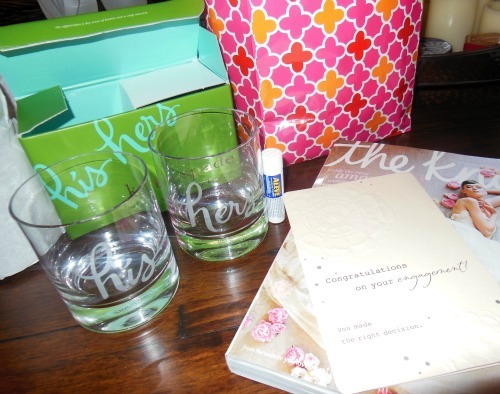 We had Kate Spade toasting glasses at our wedding and I loved them. Good luck with the wedding planning - such an exciting time! Don't you just love those Kate Spade glasses?! Too cute! 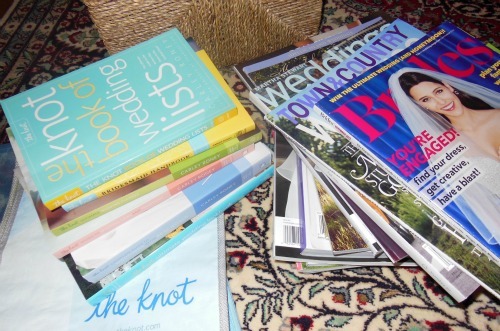 All of their wedding gifts are just wonderful! Very cute a preppy blog! love!